The main terminal consists of one building roughly "H"-shaped and is divided into five concourses. 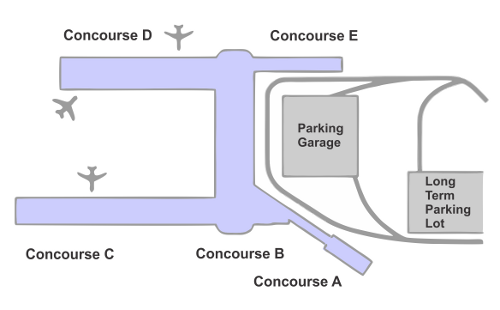 Concourses A, B, and C are on the south side of the terminal and concourses D and E are on the north; the two sides are connected beyond security checkpoints by a walkway opened in August 2005. Please contact the respective airline to confirm arrival and departure terminal and gates. Short-Term Parking Conveniently located next to the terminal, this lot has more than 3,300 public parking spaces. Garage clearance is 8 feet except where posted. A skybridge on level 4 and tunnels connect the garage to the terminal. Long-Term Parking The garage offers more than 3000 covered parking spaces, conveniently located near the airport terminal building. Tunnels and moving sidewalks connect the seven-story garage to the terminal. Garage clearance is 8 feet except where posted. Economy The 7800-space Economy Lot is located near I-205 off Airport Way. The lot has red and blue sections, which correspond to color-specific parking shelters and signage. Free parking shuttles run regularly to the main terminal every 7-9 minutes from 4:00 a.m. to midnight, and every 15 minutes from midnight to 4:00 a.m. Parking shuttles drop off and pick up passengers at the terminal's baggage claim/lower level. All shuttles are wheelchair accessible. Cell Phone Waiting Area The cell phone lot is located off of N.E. Airport Way and N.E. 82nd Avenue. As you approach the airport, signs will guide motorists to the waiting area. Access to the airport is a short 3 minute drive to the terminal. The waiting area - with capacity for up to 30 vehicles - provides a place where motorists can park for free for a maximum of 30 minutes, wait for a cell phone call from family or friends announcing their arrival, and then drive up to the airport terminal's curbside passenger pick-up area.